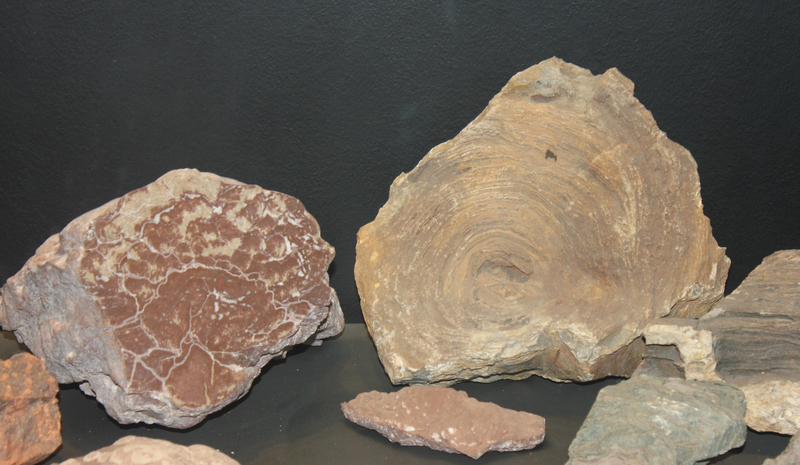 Stromatolites – Greek for ‘layered rock’ – are microbial reefs created by cyanobacteria. They’re layered mounds, columns, and sheet-like sedimentary rocks. are considered the earth’s oldest fossils. Cyanobacteria have left fossil evidence of their existence in Australia that is 3.5 billion years old. They existed in abundance back in the days when there were no animals or plants on earth. Because they were copious photosynthesizers, their waste product, oxygen, entered the atmosphere in great quantities, making it suitable for other forms of life. The cyanobacteria form structures by trapping sediment with their sticky surface coatings. The trapped sediment reacts to calcium carbonate in the water to form limestone. These limestone deposits build up extremely slowly, it has been calculated that one centimetre of structure takes around 25 years to be laid down.